The re-print of Anno Dracula has been released by Titan Books and is now on sale on Amazon.co.uk or from Amazon.com. It’s 1888 and Queen Victoria has remarried, taking as her new consort Vlad Tepes, the Wallachian Prince infamously known as Count Dracula. Peppered with familiar characters from Victorian history and fiction, the novel tells the story of vampire Geneviève Dieudonné and Charles Beauregard of the Diogenes Club as they strive to solve the mystery of the Ripper murders. 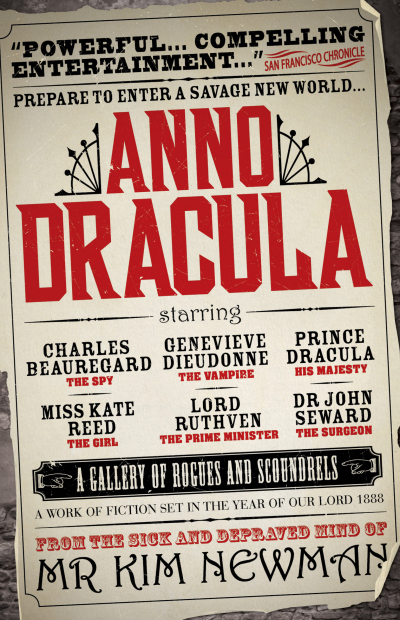 Anno Dracula is a rich and panoramic tale, combining horror, politics, mystery and romance to create a unique and compelling alternate history.